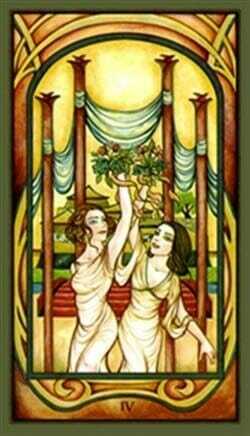 “We’ve only just begun,” say The Carpenters, “to live.” In our third card here, the Four of Wands, we have a big party. To earn it, we have two cards leading up to it where we see people getting down to business. Work before play. We could see these beginning two cards as our early twenties and thirties, first when we are on the verge of beginning our new life’s work, and then when we have stepped over the threshold and see our work coming to fruition. In Card 4 we are able to celebrate some of the rewards we have achieved, before the midlife crises of spirit sets in, when we begin to question who we really are and why we do what we do, as we will see coming up in later cards in the wands suit of the spirit. Finding our work in life is a spiritual journey, not a pentacle/earth/practical journey where we merely learn to earn our bread. We find a very large part of our identity in our career, which will be a large part of our life’s work. The initial step, Card 2, shows us holding the whole world in hand with our foot on an interesting threshold, marked with a crossing of a white lily for purity and a red rose for passion. This is especially intriguing because we find these same two symbols combined as a white rose in the hand of the Fool as he steps into his new future. The Fool carries his wand over his shoulder, dangling his inheritance behind him. Mr. Wand 2, however, is ready to invest himself in ventures on the sea of life. He readies himself to send his goods out to do work and earn for him. Mr. Wand 3 sees his ships coming in to harbor and going back out to sea, and his life work thrives. “I’m taking what they’re giving,” sings Huey Lewis, “’cause I’m working for a living.” Then comes Card 4 of Wands, and we all get to celebrate success, perhaps it’s even time to get married. If only we could stop the suit here when all is at a peak. But as we know the tarot goes in cycles, not in straight lines, and more is yet to come. It seems like an ending, but we’ve only just begun to live. 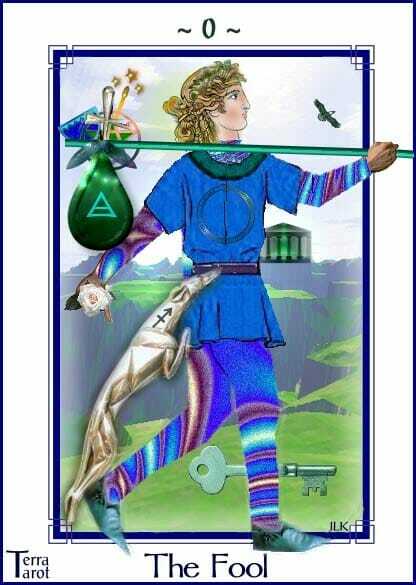 The Fool card is from the Terra Tarot deck. The Two of Wands is from the Morgan Greer deck. 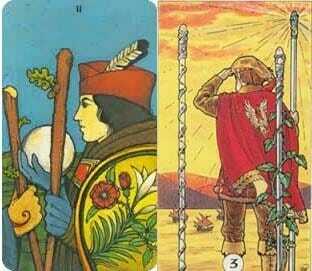 The Three of Wands is from the Robin Wood deck. 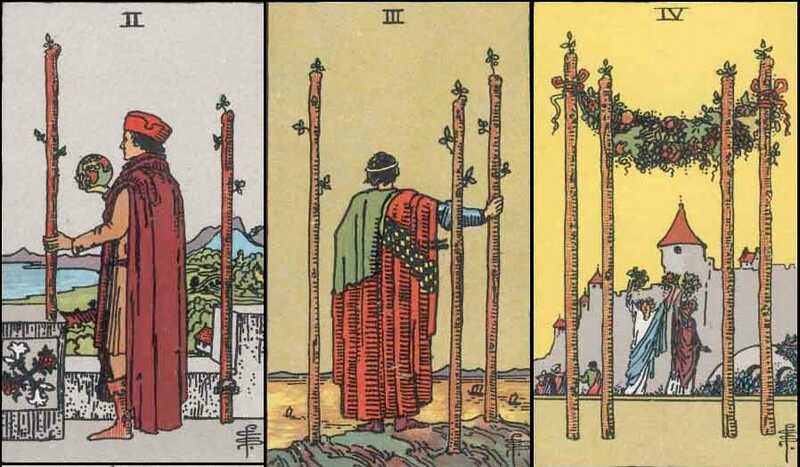 The Four of Wands is from the Fenestra deck.